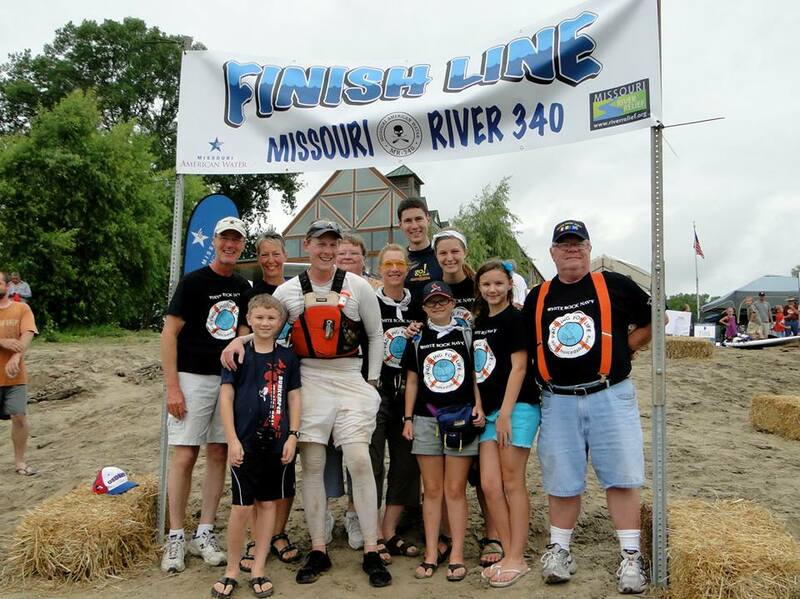 It was a long and eventful four days on the Missouri River but we made it through with only some really sore muscles. Now it’s time to recap the whole thing for you. Keep in mind that this is from my perspective. I’ll let Christian chime in if he wants. Day 1, Tuesday. Of the 342 boats registered 274 showed up at the starting line. They shot a cannon off and, at 7:00 am the solo boats took off into the Missouri River. The multi-paddler boats started at 8:00 am. Beautiful day, the temps were not too high, and the pack moved along at a pretty good clip. The fastest boats quickly disappeared and separated themselves from the rest of us but that was expected. Our first checkpoint was Lexington, 50 miles away, and we had until 5:00 pm to get there. The first thing I noticed was that the river was lower and slower than what I experienced in 2010. That first time the river was so high I didn’t see many wing dams at all. This time I could see them all along the river. They’re ugly piles of rocks and for four days I wondered if our tax dollars are being well spent considering barge traffic plays a smaller and smaller role on the river every year. The second thing we ALL noticed was the wind. It wasn’t high but it was constantly blowing into our faces. I still don’t understand how that could be because the river twists and turns. I kept expecting that the river would turn and the wind would be coming from the side or (better yet) from behind us. No such luck. Still, it wasn’t bad and the water was smooth and we kept pushing on. Just before Lexington the multi-paddler boats caught up with us. The first boat that flashed by was a six man canoe and were they ever cooking along. After that, a tandem of two women screamed past. Then there were more and more. And they all looked fresh – like they’d just started. Amazing to watch athletes like this who had gone almost 50 miles and were still paddling at a rate of 70+ strokes per minute. The winners would get to St. Charles about 8:00 pm on Wednesday – 36 hours after starting. I had some hope that I’d be able to hit Lexington before my brother and sister-in law but no such luck. They came by trying for a 3rd place finish in the race, and they were looking good. I did manage to spot Christian’s boat stopped along the river and slipped past without him seeing me. And I managed to glide into Lexington just before he pulled in. Dad was in the lead – for the moment! A quick stop in Lex for water and food and I pushed off for Waverly. By Lexington we were down to 245 boats. They were dropping out because of mechanical problems, health issues, and exhaustion. The trick, sometimes, is to go as fast as you can – but not so fast as to knock yourself out the race. Waverly must be reached by 9:00 pm and I had just managed to reach Lexington in time to beat the cut-off. In fact, as I was pulling out of Lexington, I saw the Reaper coming in. This is the sweep boat for the race. If the Reaper reaches a checkpoint before you do – you’re out. Not a good thing to even see it. I tried to pick up the pace to get ahead of that thing. The river was about the same from Lex to Waverly but this stretch was only 23 miles. I don’t know what time I got there I’m guessing it was about 8:00 pm so I was pulling ahead a little. Leaving Waverly we were down to 236 boats and we all knew that the Reaper would be laying over there until 11:00 am the next day. Good news for everyone. Darkness fell, our navigation lights came on, and we watched a giant orange moon rise over the horizon. The river changes character after dark. Or, rather, our perception of it changes. We’d been on it all day and were getting pretty good at figuring out what side of the river we needed to be on to stay in the fastest water and away from those wing dams. The breeze finally stopped and the water was like glass. Good for some better speed but everyone slowed down a bit to be cautious on that big river. I was moving along with several other boats and we all agreed that it would be good to go past the next stop, Miami, and try to sleep somewhere on a sand bar. Miami was another 32 miles – 105 miles from the start but, as the temps dropped a bit, we all thought maybe we could do it. You get greedy on one of these races and want to push as hard as possible. Also, as they say, the pain doesn’t stop until you reach the finish; and we all wanted to get to St. Charles. The bugs came out though. Clouds and clouds of them. They felt like sand hitting our faces. I don’t know what they were but at least they didn’t bite – they just got into our eyes and mouths and noses. The good thing was they it only lasted about an hour or so in the evening and again in the morning – and they they went away. I asked my ground crew for a “drop” in Miami. Instead of setting up my tent they would just leave a large bag with dry sleeping clothes, a fresh set of paddling clothes for the next day, my sleeping bag, tent, and more food. I thought I’d pull in, load all that up, and get back on the river. It was not to be. I got into Miami around 3:00 am, I think, and decided I was just getting too tired to be safe out there. I grabbed a huge plate of pancakes and sausage at the food tent, unrolled the sleeping bag, and crawled in with some dry clothes on. No tent needed and I slept great for two hours. Got up, talked to some people and had some coffee, and back on the river. Christian had passed me and was already in Miami when I got there but I found his tent, and woke him up before leaving. It was a process that we repeated through Thursday. I’d leave before him, he’d pass me some time during the day, and he’d get into the next checkpoint first. After Miami we were 236 out of the original 274 but I was about five hours ahead of the Reaper and feeling good about the race. Next stop was Glasgow, 36 miles away. I knew my ground crew would be waiting for me in Glasgow with some good food, more food for the boat and water. It was wonderful to see them on the ramp cheering me in. Speaking about my ground crew – Sharon and Katie – a word about what it is these folks do for their racers. The ground crew for one of these things has to, basically, have everything the racer might need, where he might need it, with little or no communication from him. His plans changed constantly. The stress of the race and lack of sleep throw his body into chaos and things he would normally have liked to eat sometimes don’t work. So, ground crews are constantly second guessing what their racer might want and when he’d want it. Some of the things I wanted weren’t good for me and it was up to them to put their foot down and be my brains if I was making a poor decision. They would wait for me at these boat ramps with everything ready, then hustle to improvise when they discovered I was flying past without stopping, or getting there earlier than expected, or trying to keep their nerves under control when I didn’t show up as soon as they’d expect. I can’t tell you how ALL the racers depend on their ground crews to just make it to the finish line. I got into Glasgow and by then only 217 were with us. Just down river from Glasgow is an area called Lisbon Bottoms. This is an area where the flood of 93 cut a new “shortcut” through an oxbow in the river. The corps of engineers has been fighting this and it is the strangest set of wing dams I could have imagined. They warned us about these – and that people had become turned around in years past, paddling upstream on the wrong side of them. Again, the whole river looked different than what I’d seen in 2010 but I managed to navigate it all and kept on moving. Just below Lisbon Bottoms there’s a house up on a bluff that’s famous in this race. Every year the people who live there have a party on their deck. They are looking down through binoculars and, as I cruised past I heard them hollering “Keep it up, Ned from Dallas, you’re looking great!” Really kind of fun. I pulled out for a minute to eat something, stretch a little, and watch the surprise on other paddler’s faces as they heard their names being called out from up above. Then it was on to Katfish Katy’s – 46 miles from Glasgow. Katfish Katy’s is an official checkpoint but, about 10 miles down river is a place called Cooper’s Landing. It was supposed to be a better place for sleeping so I’d asked Sharon and Katie to set my tent up there for the night. As darkness fell, and the routine evening but bug fest started, I realized that I had left my flashlight in Miami. Bad thing because, even though there was a moon, those pesky wing dams could be dangerous. In fact, I did come up on one that was just under the water. Deep enough to be hard to see but shallow enough to have caused trouble. I picked out a notch in it and heard the bottom of the boat scrape on the rocks as I slid through. Then saw another dead ahead that I managed to avoid. As quickly as I could hooked up with some other guys who graciously agreed to lend me a flashlight. They were headed to Katy’s and then said they wanted to go further. My back was just killing me so I told them I’d like to forge ahead as fast as possible, stop at Katy’s and stretch, and return their light when they got there. I’d then navigate the 10 miles to Coopers as best I could and catch some sleep. When I got to Katy’s the place was rocking. Boats coming and going and a lot of activity. It was also pretty cold and I didn’t think I’d like standing around for more than fifteen or twenty minutes waiting for the other guys. I left the lights fired up on my boat, left it on the ramp, and told the volunteer there that I’d be at the top of the ramp curled up staying warm. At the top I pulled out my emergency space blanket, wrapped it around me, flopped down on the grass and – immediately passed out. it was about 1:30, I think. I woke up at 3:00 and the place was like a morgue. 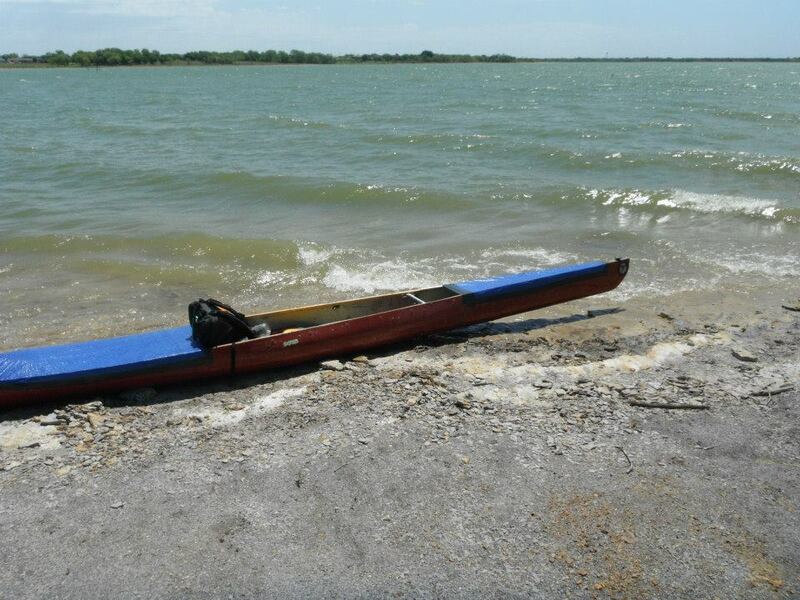 NO ONE was around and I knew that my paddling friends had come and gone without me. So, back in the boat and down the river, through some pre-dawn fog, to Coopers. Pulling in to Cooper’s I saw my in-laws pulling out. I had actually managed to catch them but it was only because Vince had been having some serious stomach problems. I have to give him credit for staying with it when most other people would have dropped out of the race. They had calculated that by hitting the finish line in 60 hours they could take 3rd place – “in the money” so to speak. Unfortunately, they missed that mark and finished in 4th place in their division. I was glad to see them but not glad that it was because they were having problems. They were on the water as fast as I got out of the water and went up the ramp. When I got there I found the most amazing tent set-up you can imagine. I mean there was everything! A bottle of soapy water and wash cloth for me to clean up, dry clothes, food, water, a toothbrush and toothpaste next to my sleeping bag. Unfortunately it was now after sunrise and I couldn’t stop for anything more than some breakfast. On to Jefferson City. We were down to 190 boats at this point. By the way, someone has looked at all the past results and figured out that the best way to finish the MR340 is to 1) be a woman and 2) get to Jefferson City. If you have those two things going for you you’re almost sure to get to St. Charles. I guess men enter this race without thinking it through as well as a woman would (imagine that!) and most people quit before Jeff City. I felt pretty good that I’d managed that second requirement. Next stop was Hermann, another 46 miles away. Moving at 5 miles per hour meant that I had about 9 hours but that’s the way it would go. This time I had no illusions about trying to push on past that checkpoint. All I could think about was getting there and sleeping. But, about ten miles down stream from Jeff City I realized I was seeing the tree people. Anyone who has done one of these will know exactly who the tree people are. You are paddling along and see someone standing along the shore. You wave and shout a good morning to them – and they don’t respond. It’s then that you realize you’re looking at a tree. But, they do REALLY look like people standing there. One guy I know said he saw some tree people, realized what they were before waving at them, and then saw them wave at HIM. They were real people who he thought were trees looking like real people. You can imagine what all this does to your mind. I was also experiencing the “long blink” where you take a blink and drop immediately into a deep REM sleep. I’d start to tip over in the boat and jerk awake. So, I sent Sharon a text message that I was pulling over. I laid on my back on a sand bar, pulled my hat over my eyes, and got about 20 minutes deep sleep. Amazing how that hot sand on my sore shoulders and back and that short sleep helped. I got up, jumped in the cool river, and was back at it, headed for Hermann. This was Thursday night and for the first time the moon was covered by clouds. 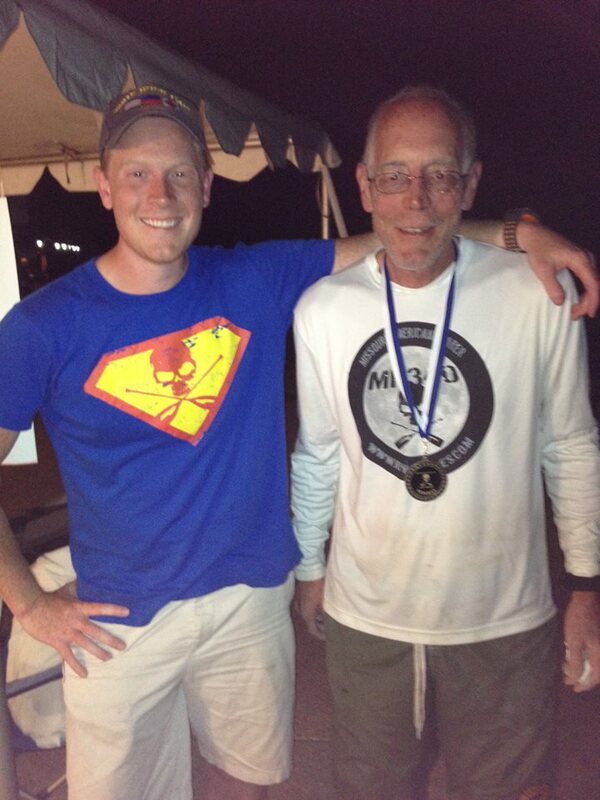 It was dark out there and I was glad to be with other paddlers. 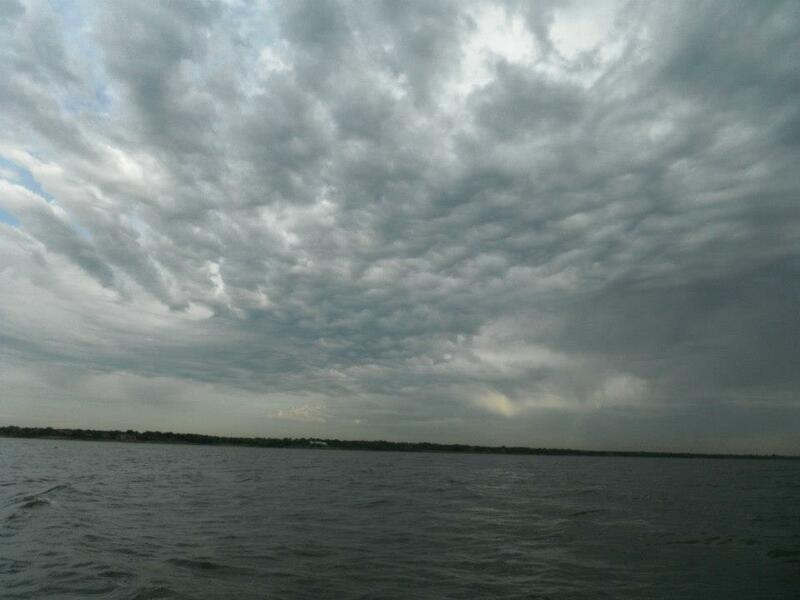 The obstacles were hard to see and, while we didn’t have trouble with the wing dams or buoys I did run aground twice. The hardest part, really, was the last three miles. Coming into Hermann the river makes a 90 degree left hand turn and continues straight as an arrow into the city. For three miles or more you can see the Hermann bridge, but it never seems to get any closer. It’s maddening. We finally did get there, though, and glided under that bridge and up to the Hermann ramp. Now, you need to understand that Hermann is a little old river town. 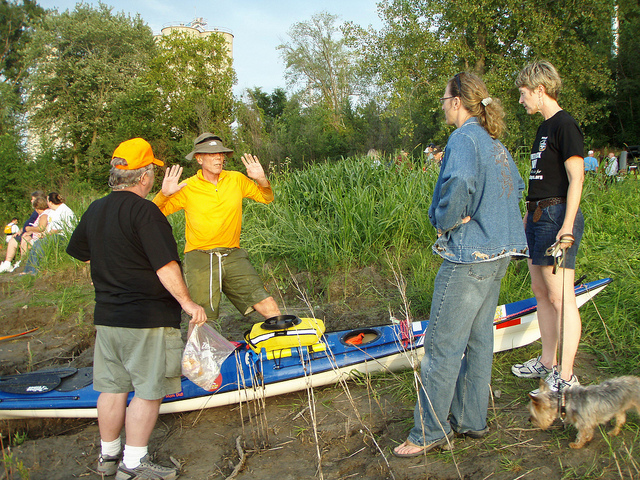 They have a quaint riverfront area and the volunteers there do a stellar job of taking care of the paddlers. They have a food tent going 24 hours where you can get something to eat, they have free camping for the racers and ground crews and……….. they have train tracks that run right along the river front, with trains that roar past (sounding their horns) every twenty minutes. As much as I was looking forward to GETTING to Hermann I was not looking forward to SLEEPING in Hermann. The plan was to go past and stop in New Haven. I was ready to take my chances with the trains in Hermann but, once again, the ground crews came through. They had scouted out the town and found an RV park about a mile from the riverfront. That was where I finally laid my head down and, this time, got four hours sleep. It was absolutely wonderful. I didn’t wake up until 7:00. Well past when I had wanted to be on the river but I didn’t care. At this point I knew I would never make my goal of 75 hours but also knew I could finish it. It was time to stop torturing myself. Another breakfast full of all that bad stuff – fats and carbs – along with lots of protein and I was headed for Klondike ramp. Klondike was 42 miles down stream. A long way to go without getting out of the kayak. Try sitting on the floor with your legs in the same position out in front of you for eight hours and you’ll see what I mean. So, as I passed Washington I made an executive decision – I am the captain, after all. I pulled off the river, walked a few blocks into town, got a cup of coffee – and an anniversary card. This was the 33rd year Sharon has been my ground crew captain and I didn’t want anything to get in the way of at least a card for her. Going into Hermann we were down to 182 boats and lost another on the way to Klondike. But, the race was close to and end and people could smell the finish only 27 miles away. It had been raining slowly all morning – not enough to be a problem – just enough to make it a different day. I had originally wanted to finish this thing by about noon on Friday. That wasn’t going to happen but I was making pretty good time and felt strong. I did realize that I might not be able to make it in time for the awards ceremony, and wanted to see Christian get his medal – he’d be done five hours before me. I also caught sight of a tandem boat way up ahead of me and the challenge was too great. So, I poured it on as much as possible and caught them at the Klondike ramp. My ground crew was waiting for me but I elected not to stop and went past at top speed. Another example of a racer pulling a fast one on the ground crew. I had now passed that canoe and, as far as I could tell, was no longer in last place. From that point on it was me paddling as hard as I could while they slowly caught up with me. As the sun was going down a safety boat pulled up along side me to tell me that it was 7:00 pm and the awards ceremony was starting – and that I was still ten miles out. I had missed Christian’s finish. The canoe came alongside and we all decided to stop racing and just move at a good pace for those last ten miles. We were almost there but there was one final bit of excitement before the end of the race. We had been told in the safety meeting that the final bridge before the finish had a lot of construction going on – and warned to go under the far right span. I counted the bridges wrong and thought there was one more bridge. So, when I got to the highway 70 bridge I went under the center span instead of staying right. As I slid under the bridge I saw construction barges, caissons, cables, and all sorts of other construction equipment blocking my way. There was no clear water in front of me – everywhere I looked there were obstructions. I assessed the situation to see if there was any way at all of getting through. There was no way except to try and go over something just under the water. I didn’t know what it was and was afraid to find out. I didn’t have room to turn around. I began backing up. I wasn’t even sure I could back a 17 foot kayak up in that current but I really didn’t like the alternatives. And, sure enough, it started going in reverse. Eventually I had cleared the bridge pilings on my right enough to pivot the boat that direction, and slide around into clear water. The finish line was now in sight. It was dark but I could see the crowds of people waiting. It’s sort of a tradition that the paddlers who have already finished will stay as long as they can to greet anyone coming in behind them. As I pulled up to the bank people reached out to help me out of the boat, carry it up the bank, slap me on the back, and congratulate me. The one face I really wanted to see was there, smiling, and I got a big kiss and hug from my ground crew chief. She’d just spend 4 days driving Missouri back roads, waiting in the sun at boat ramps, living without sleep, and trying to take care of me. What a wonderful sight it was to see her. So, that’s it. I was shooting for 75 hours and made it in 85 – three hours slower than my first attempt. 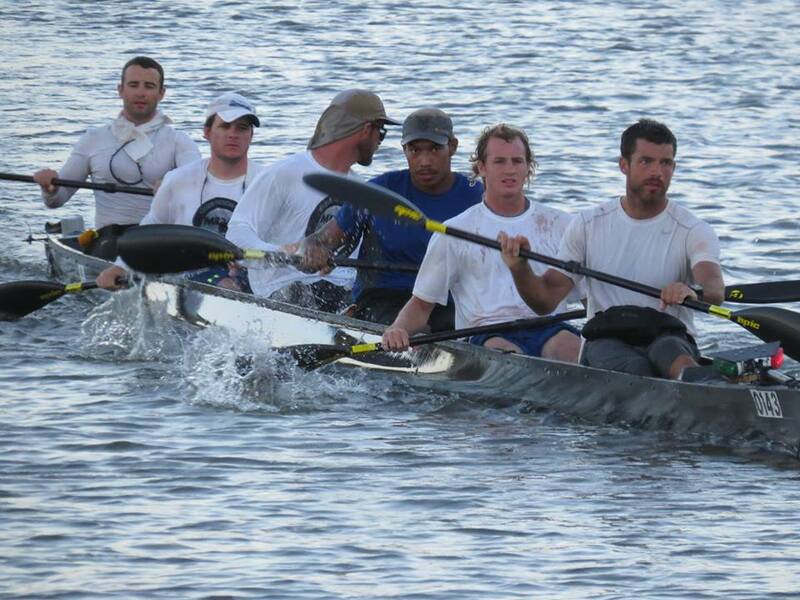 I started with 274 other boats and came in 178th out of 180 finishers. During the race I met a lot of really great people who I’ll probably never see again. I tested myself again and managed to barely pull it off! I had four days and three nights on the Missouri River. Not much sleep, some really boring hours of paddling, and some moments of excitement as I dodged obstacles in the river. Was it worth it? Absolutely. Do I plan on doing it again? Not on your life. We were shooting for $10,000 for BirthChoice and raised just under $2,000.00. Not nearly what we had hoped for but, maybe we raised awareness that there can be more choices for women than abortion. And I hope for the day when those choices are more available. Thanks to everyone who stuck with me and posted here and on the FaceBook page. It made the trip possible knowing people were watching my progress. I owe you all some kayak lessons – just let me know when you’re ready. On July 23 Christian and I will take off on one of what National Geographic has listed as one of the 100 great American adventures. He’ll be in his canoe and I in my kayak. Many people who hear about this think the idea of 340 miles on one of the great rivers of the world is looney. What they don’t understand is how very reliable small these boats are. Here’s a little interesting (I think) history of these boats. Kayaks got started in Siberia about four thousand years ago. The original design (the umiak) was about like a kayak except that the top was open. So, a kayak is , in fact, a type of canoe. Closing the top made the umiak useful for voyages out into the frigid arctic seas. Those early skin on frame boats were probably the most advanced hydrodynamic watercraft in the world – and the Wright brothers would have appreciated the technology as they rigged up their aircraft. Qajaq is the Inuit word for hunter’s boat and they were extraordinarily effective. They could be paddled into arctic oceans and used to silently approach seals, walrus, and other prey. The Eskimos and Greenlanders would take them out for days at a time, even learning to sleep in them by laying our off to the side of the boat – floating the upper body on the water. The most important requirement, though, was stability. Imagine yourself in a small boat, on sub-freezing water, in the open ocean. Anything that isn’t rock solid stable can mean a quick death for the kayaker! My boat was built by a company in Tacoma, Washington – specifically for use in the Pacific ocean. It’s a 17′ 5″ composite fiberglass boat, weighing 45 pounds, with two watertight bulkheads for floatation. I can flip the the boat, sure. But, by bracing myself with my paddle, I can stay upright even under some pretty rough conditions. What’s the downside to this design? First off, I can’t really move my legs much. They’re inside the boat and stretched out in front of me. My rear end is about two inches above my heels and I’m sitting upright. I guess I should take yoga more seriously! Also, because I’m sitting at the level of the water, I can’t get as much leverage on the paddle. Kayaks are, however, so much cooler than canoes! Christian is taking another tactic for the race – the canoe. His boat has an even older pedigree than mine. We, in the U.S. think of canoes as indian boats but the oldest known canoe excavation dates to about 6,000 years B.C. – from Holland! Those earliest canoes were basically dugouts. Heavy and slow, but tough. Variations of them have been used all over the world. The American Indians took them to another level by building them of bark. They were lighter and faster – and could still be built big enough to carry many people and large loads. The other advantage of their construction was that they were easily repaired when punctured. They’re “open decked” so, not as adapted for rough water. 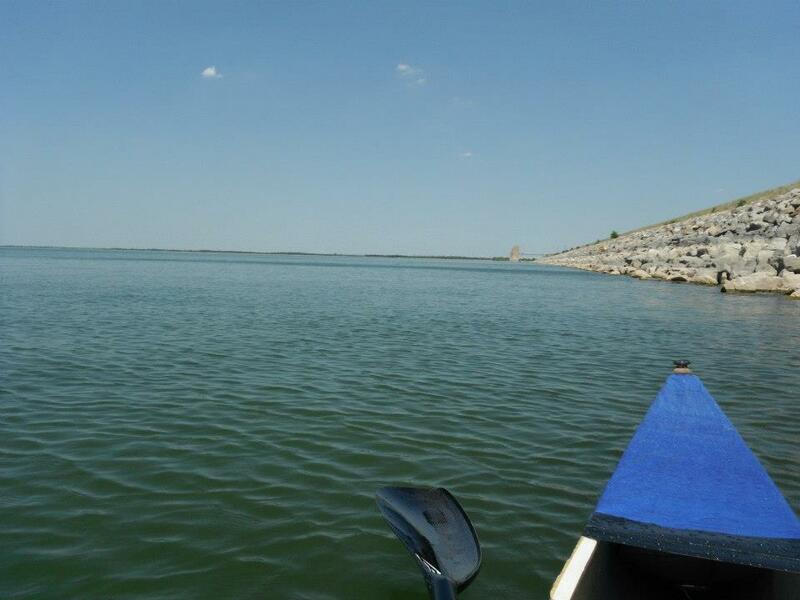 But the Missouri River is fairly smooth – until the wind kicks up or a barge comes by. For those conditions he’s rigging up a skirt. The front and back of his boat will be covered with waterproof fabric that will keep at least most of the water out! When he’s passing a barge he’ll tuck in behind a wing dam and take a break while I’m out playing in the rough water. He’s sitting higher in the boat, so he’ll have better paddle leverage and, best of all, he’ll have the ability to move his legs around. When most of you think of canoe you most likely think of the aluminum “barges” you plowed around as a kid. Those things weighed up to 80 pounds, were fat, and very stable. If that’s your vision of a canoe you wouldn’t recognize his ride for the MR340. It’s a carbon fiber composite and weighs about 30 pounds. It’s long – about 22 feet – skinny, tough, and fast. That long part makes it difficult to turn, though. And, if the wind or river current does start to turn it, it’s tough to keep straight. To cure that problem, he has a rudder. While I’m paddling on one side to turn or maintain a straight line, he just kicks the rudder and keeps his paddling cadence going – less wasted effort. The skinny part, and the fact that he’s sitting higher, means it’s tippy. But, heck, a bicycle is tippy! He’ll be able to blaze along and take more breaks to stretch his legs. His canoe doesn’t have the watertight compartments of mine so, to keep it afloat should it fill with water, Christian is installing floatation bladders. They won’t keep the water out but, if the water does get in the boat won’t sink completely. Those are the ships of the White Rock Navy. I mentioned in an earlier post that our goal is to finish the race in under 75 hours. What do you think? Who’ll be in St. Charles first – the qajaq or the kenu? In 2010, on our way to the hotel in Kansas City, we drove across the Missouri River. I looked down at it and realized I wasn’t ready. I couldn’t really paddle 340 miles in four days. I very nearly suggested we turn the car around and give up on the whole idea. Of course there was no way I could really say that, so the next morning I was in the boat ready to start the race. The first checkpoint was Lexington, 50 miles from the start. I was tired, sore, and scared when I pulled in. I was grouchy and snapping at my crew and, knowing I still had 290 miles to go, was even more convinced that I was in way over my head. I watched much younger racers loading their boats and giving up and it started sinking in that I couldn’t go the distance. The next checkpoint was Waverly. It was “only” 23 miles further and I figured I’d at least do that before calling it quits. So I let Sharon,Tim and David prep me and the boat and pushed off again. They told me later that, after I left, they all agreed I’d never finish the race. A funny thing happened on that leg. I started thinking about Miami – 32 miles from Waverly – and our planned stop for the night. If I could get THERE, I’d find the tent and sleeping bag ready. I was in a lot better mood when I pulled in to Waverly and told my ground crew to rig the lights on the boat – I’d push on into the night. When I got to Miami I was thinking about Glasgow and wondering if I should keep it up for 32 miles and maybe sleep there. But, Tim and David were settled in so I crawled in my sleeping bag and slept better than I had in a long, long time. From then on it was one stretch at a time, one boat ramp at a time. Just paddle to the next bridge, around the next bend in the river. I threw away the maps I’d been carrying of the whole distance. I’d pull in to a check point and ask Tim “How far to the next check point?” I quit worrying about the entire race and just took it one bite of 30 or 40 or 50 miles (or less) at a time. I’ve already blogged about how motivating it is for me to see the numbers of people who tune in by subscribing to the blog (about 30) and liking the White Rock Navy on Facebook (we just passed 50). It’s a kick for me every time I see the numbers go up but I’m greedy and want big numbers! When I’m out on that river and it’s 105 degrees I need to know there are lots of people behind me. So, do me a big favor and help spread the word. One person at a time from now until July 23. 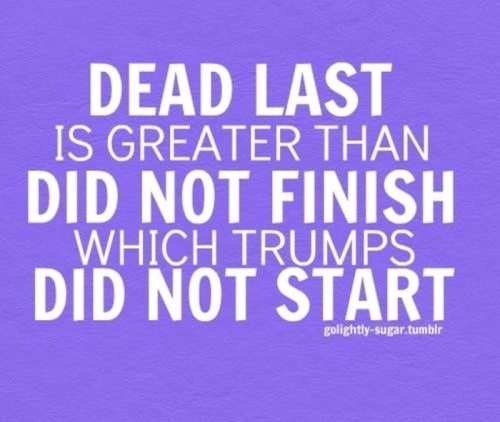 Then it will be 1 mile at a time for me.